The fight was almost over, and it had barely started. Beedril was buffeted by the echoed voice, which left the Pokemon struggling to remain airborne, its buzzing and wing beats laboured. It clung stubbornly to consciousness, the lingering Weedle looking troubled for its parent in the background, watching as the Beedrill fired off poison sting after poison sting. Even with its higher likelihood to crit, it was really no match for Furfrou in the end even if the Kalosian ended up poisoned. "You're very welcome, Absol." Professor Oak replied with a smile. The Pokemon sure was prideful, but he made no comment on it, "And yes, of course you can! In fact, Fantina, a ghost type gym leader from Sinnoh is also a top co-ordinator! And because the second half of a contest involves battling, it can be a great help for performance and strategy to be an expert in more than aesthetics, but it's important to keep in mind that the styles of battle are different. Battling in a gym is solely about overwhelming your opponent. In a contest, it is as much about showing off your Pokemon's charms and abilities in an appealing way as it is about winning the fight. in fact, in a contest, a co-ordinator can still win if both Pokemon are standing, so long as they have more points than the other side! Do you understand?" "That's it Furfrou, let's finish this properly," Felix was pleased to see his furfrou letting off some steam, which also allowed the man himself to relieve himself from the anger and stress that earlier battle had brought to him. He did not hate the Absol's eagerness for battle, but the girl's incessant intervention did strike a nerve with the rather arrogant man from Sinnoh. "Use Echoed voice again and finish that damn Beedrill off with a headbut!" The furry pokémon tensed its legs again, enduring the beedrill's poisonous stings to the best of its ability, while breathing in deeply and letting out a tremendously loud bark. At that point, it bend through its hind legs a bit and jumped up to deliver the coup de grace with a headbutt. "Vae Victis," Felix laughed, when looking at Furfrou. "Abyss," Eve warned in a low voice, receiving a glare in return, but the Absol did regardless get to his feet. Piercing red gaze swiveled back to the professor, who was appraised for a moment before Abyss stepped closer and rubbed his head against the old man's leg, gratefully. He even lingered a moment, wagging his tail before circling around and standing beside Eve. The female hardly considered this appropriate gratitude, and didn't intend to hold her peace. "Come on, now, Abyss, he healed you. He helped you so much. Go thank him properly." She pointed, and was met grumpy obedience. Abyss padded back, sitting down right in front of Oak and lifting a paw to be shaken - a movement he and Eve had practiced many times; mostly because she liked meddling with his paws. To offer a paw to shake was a fairly standard trick taught to canines, and Abyss had learnt it easily, after observing her executing the polite gesture. However, under that facade, she could see the Absol was grudgingly approving of the old Professor, and she knew the experienced elder could probably see it too - after all, he'd spent all his life around Pokemon! He went on to explain the flexibility of her choices, and she eagerly soaked up every word. "Wow. From Sinnoh, huh?" The idea of a foreign beauty intrigued her, one who was obviously skilled in the field of Pokemon. She glanced at Abyss. "Showing off...I think we can do that." She grinned at Abyss, and the Dark type's mouth curled into an upward curve. Even just one attack would've done the trick. The Beedrill dropped limply to the grass turf, the onlooking Weedle visibly distressed as it looked on. It was clearly torn, wondering what it could do to help or if running away was for the best. Either way, Furfrou's practice battle had gained him a level and made him a bit happier, so the result was good all around for Felix! Professor Oak chuckled, shaking Abyss' paw delightedly, "Well, we got there in the end, but I did think his previous gratitude did do the trick." He said, waving it off, "Anyhow, the current star co-ordinators are Marina from Johto and Kanto, and Wallace and Lisia in Hoenn. In fact, Wallace is the Elite Four champion and Lisia's uncle! It's worth looking up some material on them if you're interested, they'll give you an insight into contests and maybe inspire some combinations! Perhaps buy some seals and capsules for your Pokemon, too. They'll add something personal and appealing to any kind of introduction!" Felix sighed when looking at the Beedrill laying down on the ground unconscious, perhaps he had to show at least some dignity towards the pokémon for granting him and Furfrou a moment of getting rid of the stress and disappointment from earlier. So rather than leaving it lay there in the open, the masked man showed a threatening glare towards the weedle, making it expressly clear that if the weedle even moved a single inch, he would not hesitate to use force. When he reached the beedrill, felix tried to lift it up and carry it to the nearest tree, to put it down and allow it to rest near the tree, while he and furfrou would still remain waiting a few feet away. Just to make sure furfrou wouldn't have any problems regarding aftereffects of the beedrill's poisonous attacks, he recalled his chansey from her pokéball and asked her to perform her healing bell move, which she did with pleasure. "If Eve isn't here in the next five minutes, I'm out," The masked man sighed again, taking a last look at the Beedrill and the weedle before recalling chansey and Furfrou to their pokéballs, since after so much exercise even Furfrou must've been quite tired. "Might as well go to the city for a check up at the pokécenter first. I guess I'll find Eve along the way..."
"That's right. They're sold mostly in markets, but some Poke Marts stock them as well. I'm not sure Viridian or Pewter do, however." The Professor admitted. When Eve guiltily said that she had to go, the man insisted she hold her Rapidash a bit longer. "Well, that can't be helped, but as I said, I do have presents for you." He said, and with that, the man handed over a Pokedex and Full Heal. "Here, your official Pokedex and something to help you through the forest. Use them both well!" "And I have gifts, too, girlie. Giving me a literal run for my hard work! Ohohoho!" Warrod chortled. The elderly grass-specialist produced a technical machine and some blue-wrapped candies from his trouser pockets, shakily placing them into her pocket. "For you, dearie, to help you on your travels. I think Abyss can use dark pulse, it'll help you in Cerulean and Saffron Gyms, definitely." He nodded, "Good luck, lassie, stay in touch, hmm?" "Oh, thank you, Professor!" The gratitude escaped the female's mouth involuntarily, a response to being offered things, but her eyes widened at the valuable objects offered to her. She knew beginning trainers were given PokeDexes, but it didn't change the fact that they were extremely sophisticated pieces of technology. She inspected the medication of a while before pocketing it - it would likely serve its purpose healing Abyss, whens he couldn't have done it before. She gasped as Warrod pressed a Technical Machine and some candy into her hand. Technical Machines were expensive! But never mind that, oh the candy! Eve wished she could add little type-written hearts at the end of her sentences, but she sufficed with pouncing to give the old man a huge bear hug. "Thank you, Warrod!" Abyss leaned in to curiously sniff at the Leafeon. Warrod jumped, clutching tightly onto his stick as Leafeon withdrew from Abyss. It wasn't a mean move on the Pokemon's part, it was just that he wasn't the strongest or steadiest man these days, and she was afraid that Eve's overzealous glomp might knock him over. When she was sure that he was fine, the Leafeon moved back to Abyss to sniff him back. "Oh, you're welcome, you're very welcome! Just make sure you put everything to good use!" He replied, patting the new trainer on the back. Professor Oak laughed and shook his head. "You best get going, Miss Iridescence. You don't want to keep your friend waiting any longer." He prompted of the young lady. Abyss leaned back slightly as the Grass pokemon returned the curious gesture - his fur fluffed out slightly as he continued to gaze at the smaller pokemon with undisguised interest. His nose twitched, disconcerted. Meanwhile, Eve wasn't letting up the hug, still squealing and flailing about slightly while having her arms tightly locked around the old man; well, at least she wasn't doing anything by halves. When a good few seconds had passed, she let go and enthusiastically waved, glee writ large across her face. "Of course, of course! I'll call, definitely!" She turned, grin persisting on her face, to leave. Waiting for Eve was boring, but at least he had managed to get to the pokécenter to get his pokémon healed up for a good trip. Felix had to make sure he got back to the meeting place on time though, so rather than some small talk with the nurse joy, he just quickly got back to the edge of the forest, hoping that the girl did not have to wait for to long...if she was already there or not. Eve had recalled Abyss for the longish trek back - especially as she was climbing uphill. Now that she was travelling at a slower pace, she could look around better. But no time for sightseeing! She was keeping Felix waiting! She soon found herself back where she started, around halfway up the hill, but on a lower level than from where she started. Oh, yes, the ledge she'd taken a flying start from. She looked around for Felix as she approached, turning a corner and spying the masked man, approaching from the other side. Neither had kept the other waiting. How wonderful. She made a beeline for him. He didn't know wether or not he had been just in time or had missed the return of Eve, but when Felix noticed her running towards him, he could only show a feint grin, as it was possibly quite a cringeworthy moment for him. There was nothing wrong in traveling together with a youngster like her, yet somehow he felt a bit weak. Even if he undoubtedly had the physically stronger and more mature pokemon, the very sight of the Absol and the reminder that their battle hadn't been an easy one, even before it had managed to be concluded, made Felix wonder if he had better not stepped up his game a bit more. If he ever wanted to beat H.G. and stand at the top of the pokémon world...he didn't really have any other option than pursuing only excellence and perfection. "Hey kid, took you long enough," the masked man snarled rather playfully. "Well? Are we all set and ready to go?" Eve was panting and huffing by the time she came to a doddering stop beside Felix. Abyss broke himself out of his ball - had he always been capable of breaking the seal? He, naturally, was composed, especially as he hadn't run all the way back at record speed. His condescending look at his poor trainer earned him a dig in the ribs by her shaking knees, causing him to fluff up, disgruntled, and he moved away to a distance. "H-Hai, Felix," Eve finally managed to gasp out, running her wrist over her forehead, which was finely beaded with small moisture droplets. Her eyes were alight, the courtesy of her recent 'exercise', and a grin spread over her face in greeting. She smiled and nodded to Furfrou as well; unlike the man, she had little to no feelings of resentment and competition. Her sparkling world had no resemblance to Felix's grim world of fighting tooth and claw for survival. The contrast was harsh and unforgiving. But she, oh ignorant she, had no way of knowing this. "Yep, yep. All set." She nodded to emphasize her affirmation, holding out a hand to call Abyss to her side. Her white-furred vulpine was again casting curious glances at Furfrou, harbouring mild hostility towards the fellow snowy pelted mon. Apparently he held grudges. For a moment, the masked man looked at the huffing and puffing girl, thinking if he was ever a parent, his kids would damn well have a better condition than this lass. Luckily, he did not speak his mind out loud and in stead simply shrugged his shoulders, while bending through his knees when the Absol had broken out of its ball with no apparent issues. In a way the absol was somewhat similar to Furfrou in that regard, despite the fact that there behavior seemed completely different. "I reckon you're ready," Felix simply looked at Absol when stating that, but it could've been directed to anyone. He got back up to his feet, rubbed Furfrou's furry head for a moment andd started walking towards the forest's entrance again like before. "Just saying...This place has some pretty strong pokémon in it. You do have enough medicine with you to make sure your pokémon won't be hurt, right?" Eve took a deep breath, quietly regretting saying she was fine. Truth be told, she'd have appreciated a moment's rest, but calming her nerves and allowing her adrenaline to settle, she followed the masked man. Why did he wear that mask, anyway? Was he a wanted criminal?! "What?" She hadn't been listening to what he was saying, immersed in her own thoughts - bizarre as they were - and had missed his question. Something about medicine? "Yeah, yeah, I have some Potions," She spoke quickly, unsure if that was what he was asking about. A forest was a complex web of biodiversity, and she was sure that even if she ran low on man-made medicine, she'd find some natural herbs or Berries to use. After all, she'd grown up around this area. "Well, if you're ready and I'm ready," The masked man gave eve a calm, polite smile. It seemed the journey towards Pewter town and thus the first recognized gym of Kanto's own league was going to begin, an exciting idea for someone who aspired to stand at the very top. "Than I reckon it's time to get through this forest as best as we can." With a rather fast pace and long strides, Felix started walking into the forest, cautiously looking around to make sure they wouldn't be ambushed by a swarm of beedrils or anything, though he'd obviously ignore all icky crawling insect pokémon for sure. "So Eve," Felix tried to adjust his pace a bit to make sure the girl wouldn't get exhausted in the first few minutes of walking, let alone end up being irresponsible and loose her somewhere. "I never asked, but where are you from, since you don't seem to mind this place I guess not far from here, right?" Eve nodded at the smiles she received - was it a mere veneer he wore, much alike the mask? - and trotted along at his side. She wasn't especially trying to stand directly by his side, as the regular forest trail was just about wide enough for a person and a medium-sized pokemon to walk along. She imagined that if she ever possessed a large pokemon like Nidoqueen, it would likely walk behind her, like a bodyguard. The thought evoked a spontaneous giggle that she quickly stifled, lest Felix question the irrational action. Felix was a lot taller than Eve, leading his strides to be that much longer than hers, causing the female to hotstep her way along at something more than a brisk pace - it was an awkward half-jog that was making a not of noise. Eve cringed as she mis-stepped on an especially dry, crunchy and noisy patch of leaves, setting up a great rustling and crackling in the surrounding areas. She huffed quietly and settled into her own leisurely pace, causing the two to gradually grow apart in distance. So far, there was only one path to follow, but as Felix likely didn't know how to leave directional signs with twigs and leaves and stone, Eve tried keeping him in her sights. She'd likely have the lesser trouble in getting herself out of the forest in case they got lost. Of course, she had to consider the fact that both of them had canines by their side as well...where Felix would err, Furfrou would lead. Just as she knew Abyss would for her. Once again, she was lost in thought regarding the difference between her defined, sculpted, fair looks to the traditionally darker skin of the natives when Felix matched his pace, causing her to bump headlong into his back. Eliciting a small sound of surprise as a response, she faltered, creating a step of distance between them, she let out a low squeal as she shook her head, gathering her scattered and surprised wits. "What?" She asked this far too often. "Oh, yeah. Yup, yup, I live somewhat close by. It's about a five hour's walk from Pallet, and the route passes by the outskirts of Virirdian. It's situated in the forests, or rather the infringes of it," She provided helpfully, not that it was likely Felix wanted to know all that much. There were so many things Eve was curious about - where to start asking? As the group meandered through the forest, it would be obvious that they were surrounded by plenty of Pokemon. Hoothoot slept soundly in their nests while Pidgey preyed on bugs in the light of day, a group of Ledyba making sure to keep out of the way as they minded their own business. In the distance, visibly bouncing in the tall grass was a Spoink, seemingly playing with a Seedot while a Caterpie watched on from the side. As he had already made quite clear, Felix was not going to be distracted by any bug pokemon, though admittedly he did stop for a moment when he noticed the group of Ledyba, which seemed harmless and in some way relatively cute. The spoink and the seedot in the distance seemed interesting as well, but not interesting enough to force the masked man to go towards them and have a fight, certainly not when they hadn't even managed to walk more than a mile thanks to the thick grass and the bushes. "That reminds me Eve," The man picked up the pace again, making sure he'd be at an easy pace for the girl to follow. "With so many bug pokémon in the forest, isn't it a bit dangerous for a dark type like Absol?" Eve was relieved when Felix didn't seem to mind her bumping into him - she hurt enough anyway. Trying to discreetly rub her aching face - his back was rock hard! 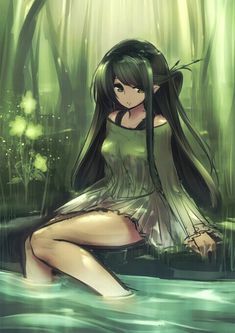 - she looked around, admiring the quiet stillness of the forest. Life grew quietly, unobtrusively, and yet it silently thrived. Even here, in the dense undergrowth, a wide variety of species was to be found - each mingling, and carrying on with their lives peacefully. Taking a moment and pausing to inspect the herd of Ledyba pass by, she ran lightly on the foliage to catch up to Felix, just in time to hear his question. Automatically, her gaze traveled to the Absol in question, at the same time Abyss looked up. Their eyes met, red into green, and the flustered Dark type looked down again - could only Eve find a chink in his proud facade? The teenager giggled and gripping a pinch of fur, tugged lightly. The indignant Absol began to grumble. "Dangerous? I suppose so, especially when he's so fragile," She accentuated her sentence with a tug of his fur, causing the male to say a quiet 'Sol', "But he likes to walk alongside outside, and not everything here threatens him," Her gaze shifted to a rustling in the grass, and she pointed to the Spoink she thus saw there. It would have made for a quick and easy training session for Abyss, but she chose not to intervene. Seeing the two humans there, the Spoink must have said something to its companion. Even as the psychic still bounced, it was obviously paying them close attention, and the Seedot hid itself in the long grass behind its rarer friend. The bugs didn't seem to react, probably because they were slower and likely more docile unless struck. Felix really did not care for the spoink and the seedot, though he did look at them and pointed at them, just in case if it might be interesting for Eve to fight or capture one of the pokémon. "Neither of them is what I desire and I can't risk straining my pokémon too much in this forest," The masked man looked at the girl and the Absol behind him. "I think that one's a psychic type by the way, so IF you desire to fight it with absol, you'd have a good advantage." Eve hesitated as Felix pointed out that she could take on the Spoink rather easily, in what seemed like an unfairly advantageous fight to her. But it'd be great training and warm up for Abyss. "What say we turn up the ante a bit, hum?" She spoke quietly, reserving the words for the sharp ears of the attentive Absol. Gaining a quizzical look, Abyss stepped forward, reiterating a 'Sol' to gain the two's attention. Was Eve thinking of challenging the two of them? What, both at the same time? "Well...don't hold back," felix couldn't help but let out a soft chuckle, as it seemed that the girl was interested in at least one of the pokemon that they'd seen off of the path they were following. "I won't be standing in your way if you do desire to battle or capture a pokemon." In the meantime, the masked man could use that moment to look around a bit more to see if there were any other and perhaps more interesting pokémon around that suited him more.